VANDALIA — The Vandalia City Council denied a variance request by a resident on Pool Ave. that would have allowed the property owner to build a shed in the front yard of a corner lot at Pool and Randler Avenues. The property owner had requested the variance because they wanted use the back yard of the lot for entertaining and gardening but stated to the Board of Zoning Appeals (BZA) that a shed would not allow the back yard to be used for those purposes. The BZA unanimously rejected the variance at its Sept. 23, and City Council agreed with a 6-0 vote on Monday night. Other items on the light agenda was a decision by Council not to request a hearing by the Ohio Division of Liquor Control for a transfer request for the Little York Tavern. The Vandalia Division of Police recommended that no hearing be requested. Video of the meeting is below. Council also declared several items as surplus from various departments around the city. 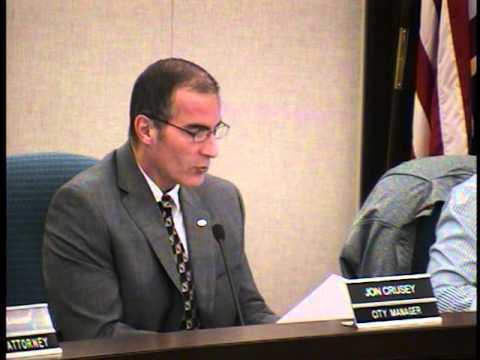 The resolution authorizes City manager Jon Crusey to dispose of the items on GovDeals or other ways provided by law. Council also set its summer meeting schedule for 2016. Council will hold just one meeting per month on June 20, July 18, and August 15 at 6 p.m.
During the City Manager’s report, Crusey said that council will hold a retreat on Saturday, Oct. 24 from 8 a.m. to noon at the Cassel Hills Golf Clubhouse restaurant. The purpose of the meeting is to briefly tour the golf maintenance facility and then to review ongoing/completed capital projects, receive a presentation on golf operations, and to review the golf operations and maintenance budgets. He also said that council will hold workshop meetings to review the proposed 2016 budget on Thursday, Oct. 22 and Thursday, Oct. 29 at 6 p.m. The workshop will be held in basement of the Municipal Building. The Vandalia City Council will hold its next regular meeting on Monday, Nov. 2 at 7 p.m.